← Fighting Parkinson’s, and okay, okay, okay! 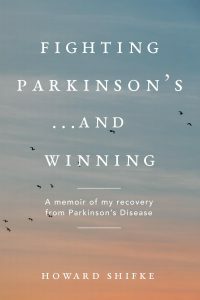 When you heal yourself from the inside, chipping away, day by day, saying “okay” to whatever it is that Parkinson’s is throwing at you, you are making progress day by day and you take control of your Parkinson’s. The more fear you give your Parkinson’s, the more it will run away from you. When Parkinson’s tries to give you fear, choose faith. Your faith, in turn, puts fear in Parkinson’s — that is how you control your Parkinson’s instead of it controlling you. So, grab onto the Recipe for Recovery, say, “okay,” and chip away, day by day, with the full faith in your heart and soul that you are on your path toward recovery. Loved the titanic/iceberg analogy. All I want to say is bring it on. I am okay, it’s okay. I am chipping away from the inside. Keep your faith peeps and good luck all. Thanks for posting this again, Howard. It is so beautiful, and such a perfect analogy. You are welcome. Thank you for your comments as well. Excellent work. superb analogy. most imp, your conviction has cemented foundation of your experience. God bless u.
i remember to say OKAY! i need also to thank you for this history reminder of how the recipe came to be. The reason for the ‘ how’ in your name .